DriveHQ's Cloud File Sharing & Collaboration feature is not only easy but also powerful. You just need to right click on a folder and select Share to share it with others. Folders can be shared to both DriveHQ members and non-members. For advanced folder sharing, you can share folders to different users with various permissions. If you have a lot of sub-users, you can create sub-groups or contact groups. You can even share folders to subgroups / contact groups for enterprise group collaboration. You can share folders to multiple users, subgroups or contact groups with various permissions. We support the following permission levels: No Access; View Thumbnail; View Preview; Read or Download; Read & View Comment; Read & Comment; Add or Upload; Add & Edit; Full Access. If you share a folder to a subgroup/contact group, then all users in the sub-group or contact group can access the shared folder. If you have a new user who needs to access a shared folder, just add him to the subgroup / contact group. 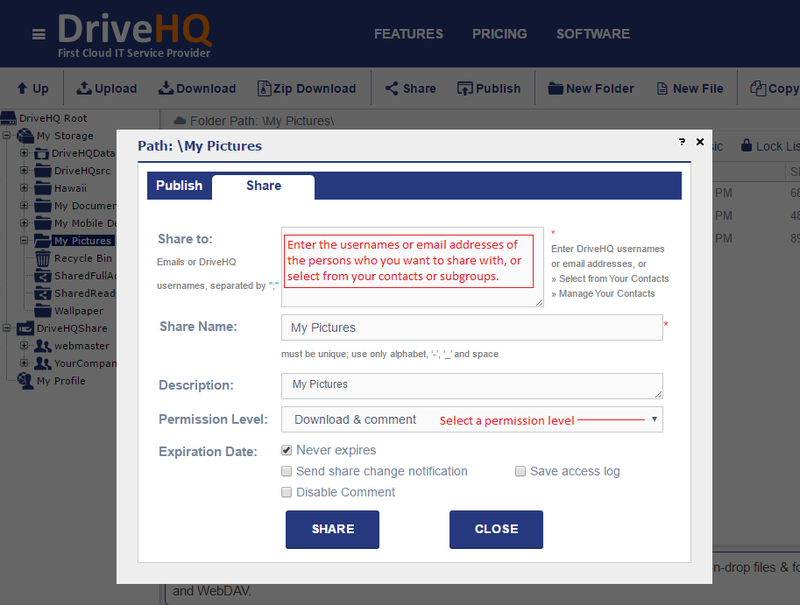 To share a cloud folder to a non-DriveHQ member, you just need to right click on the folder and select Share; then enter the email address of the user into the "Share-to" field. You can share the same cloud folder multiple times with different share names and permission levels; also, if you shared a cloud folder, you can still share a sub-folder or parent folder of the shared folder to other users. You can setup an option to send a notification email to you and all share-to users when someone has changed a file in the specific shared folder. When you share a folder, you can set it to automatically expire after x days. DriveHQ's Group Admin Tool allows you to create, view, edit, and delete sub-users in your Group Account. With our group account service, you can easily collaborate on a project with a team. Different team members can play different roles, e.g. a subgroup admin has full-access to all files in a shared folder; a sub-group member can only access a sub-folder; an external client can only view a specific sub-folder. You can share your cloud storage with your group members. There are two ways to share cloud storage space. The first one is to allocate storage space to sub-users (which will reduce your main account's storage space). The other method is to share folders from the group owner account. Sub-users do not need storage space/download bytes if they will only use folders shared by the Group Owner. You can share folders to different users/subgroups with various permissions (such as read-only, read-write and full access). Users just need to log on to their own accounts to access the shared folder(s). Multiple people can collaborate on a single Microsoft Office file. When the first user opens the file, it will become locked. More users can open the same file, but it will be read-only. After the first user has finished editing, he can save the changes and close the file. Other users can be notified of the changes, and one of them can then access the file with read-write access. A user may lock a file and forget to unlock it. It will prevent other users from editing the file. In this case, DriveHQ offers a lock management feature. The file owner or group owner can access the Lock List and manually unlock a locked file.